I had some questions about how to do the lighting at the house, so I wanted to see how actual professionals light buildings like.mine. I knew I would find good examples on the Ile de Re, which is basically the Martha’s Vineyard of France. I figured out the lighting thing easily. Generally the trick is to install spot lighting. Fixtures are accents, used for task or mood lighting. If you have to light a space with beams, where shadows could cause problems, you rely more on wall sconces and table and floor lamps. It was easy to look around. The photo above is the main tourist street in St.Martin, where home prices rival those in Paris. As you can see, no one was there. Apparently some 60% of the homes on the island are holiday homes; I think in St.Martin the number must be closer to 90%. This brings me to my shopping tip. If you want high – quality goods, fashionable casual clothing, and you want them at half off, come to St. Martin in December. In the course of my research I was forced, forced I say, to stop into a few stores. The selection was excellent. The shops were packed with goods, if not people. Some time, maybe I’ll show you what I bought. Well, not exactly gems. Occitaine en Provence at half price is a steal but hardly a gem. I got these great Orientalist lamp shades, just the right amount of tacky. Those were full retail. I think it was the guy’s only sale in quite some time. That’s the other thing. If you want drop-dead gorgeous, totally out of your league French guys to treat you like gold, don’T waste your time on a toy boy. 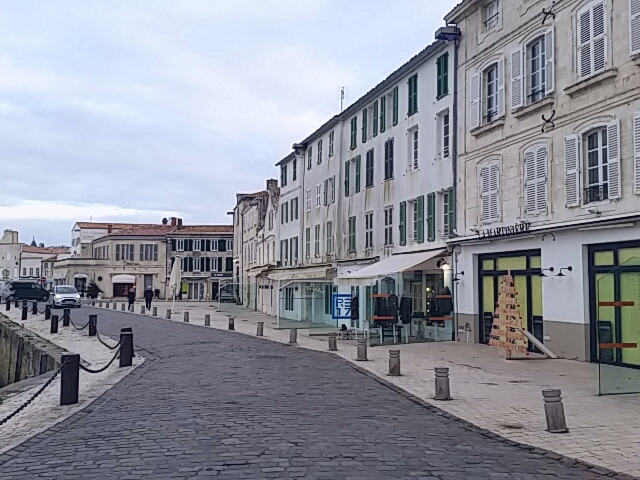 Head for the Ile de Re in winter. You’ll get a superficial but genuine exchange and you get to keep what you buy.